The Omaha Running Club has more than 500 members and has supported the Omaha running and walking communities since the early 1970s. The roots of the club are in the Elmwood Park Track Club, The Omaha University Track Club and The Plains Track Club. These early groups of organized runners evolved in today's Omaha Running Club. The Omaha Running Club is a member of the Road Runner's Club of America. Each year, the Omaha Running Club honors individuals who have significantly contributed to the Omaha running community. 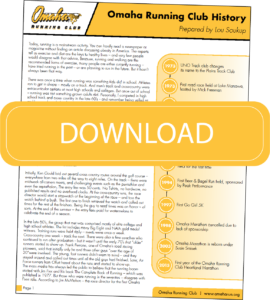 Lou Soukup, ORC Advisor and Hall of Fame committee chair, walks you through the vast history of the Omaha Running Club. Join a network of more than 500 runners all supporting our local running community.